After Samsung axed the camera module from its smartwatches after the first Galaxy Gear it appeared that was the end of the feature, but it looks like LG has other ideas. The South Korean company has recently filed a patent with the USTPO (United States Trademark and Patent Office) for a design of a smartwatch with a camera module. The patent was spotted by LetsGoDigital showing a "a smart watch comprising a camera" and includes a couple of designs of how a camera could integrated. 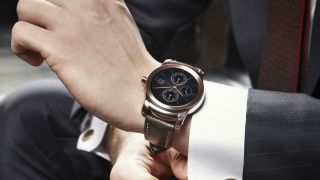 The patent also has references for 'mobile terminal' features, hinting that the smartwatch might come with cellular connectivity as well. While several camera integrations are detailed in the listing, they all have one thing in common - they're all built into the strap, rather than the actual body of the smartwatch. For example, an adjustable wrist band could allow the wearer to change the angle of the camera, while another option could be to include a metal link for the watch band, where one link comes with an integrated camera. A third possible solution could be to attach a spring click that can be placed anywhere on the watch band. Examples within the application claim you could take a picture of your food and then track your calorie intake, or even scan the barcode/QR code at the supermarket. If the real-world practicality and applicability could be brought to overlap, this could be a real winner. A patent filing doesn't necessarily mean that product will make it to the market (it could be found to be nonviable and therefore be abandoned).